"We are fighting against entrenched interests whose infectious greed has decimated our people," House of Representatives Speaker Aminu Waziri Tambuwal said as he opened the two-day debate. "Therefore, be mindful they will fight back and they normally do fight dirty." The 205-page parliamentary report uncovers a long list of alleged wrongdoings involving oil retailers, Nigeria's Oil Management Company and the state Nigeria National Petroleum Corporation. 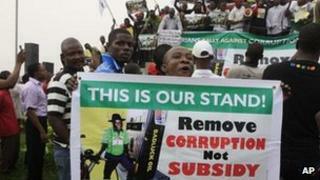 The BBC's Bashir Sa'ad Abdullahi in Abuja says at least some of the findings are likely to be adopted by Nigeria's lawmakers because of the huge public anger over the attempt to withdraw the subsidy. Many Nigerians were livid when they were told by their government that the fuel subsidy was economically unsustainable - only to now find out the scale of fraud in the operation of the fund, our correspondent says. The annual $8bn subsidy means prices are lower than in neighbouring countries - and correspondents say many Nigerians see cheap fuel as the only benefit they get from their country's oil wealth, much of which is pocketed by corrupt officials. After a week of street protests and a general strike, the government agreed to restore some of the subsidy - and reduce the pump price of petrol to 97 naira (about $0.60) per litre after it had doubled to 140 naira when the subsidy was removed without warning on 1 January. But President Jonathan defended the subsidy cut, saying Nigeria must either "deregulate and survive economically, or we continue with a subsidy regime that will continue to undermine our economy."